So umm…This is what I am wearing today.. Very Modero has come out with a very stylish Mesh Snug coat. There are many colors to choose from and each coat has a colored scarf. I have put on a cozy thermal turtleneck from ghee but you could go without and just wear a lovely long necklace. Besides the built in scarf I love the long sleeves that hang over the tips of my fingers! This is a very versatile coat and one you will want in every color! Isn’t this gown beautiful? It comes in many colors…but there is the juicy good news. This one below..the red one? Yeah that one. It’s only 100L right now at Going Bust. Maai’s Madam Butterfly Gown in Red. 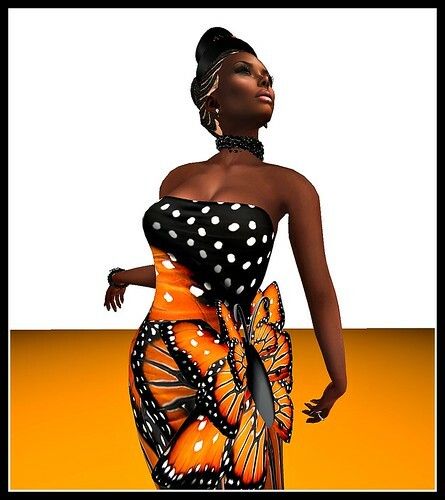 This MESH gown includes 5 sizes, a butterfly adornment for the hip and a hat as well as Lolas Tango Appliers. LM’s for everything else can be found in the Links Tab at the top of my blog.